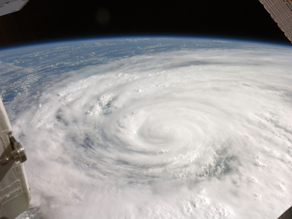 Hurricane Ike went down in the weather annals as the third-costliest tropical cyclone in U.S. history. Weeks after Ike's landfall, a whirlwind of destruction can still be felt hundreds of miles inland, in the Great Lakes region. Heavy rains from Ike and the Pacific Tropical Storm Lowell inundated northwestern Indiana and metro Chicago. The ground was already saturated by a stalled cold front so the increased flooding caused runoffs from streams and rivers, dumping sediment into Lake Michigan and increasing E. coli levels in the water. United States Geological Survey (USGS) scientists have been monitoring the water in Lake Michigan after Hurricane Ike, as part of an effort to improve predictions of beach water quality. Dr. Richard Whitman, USGS expert on beach health ,says, "The local effects that Ike had on Lake Michigan's Indiana shoreline, water depth, and water quality have been profound." Typically after a storm, bacteria levels rise along near-shore water sources, but, Ike brought with it a slew of other problems. The flooding caused by Ike loaded up Lake Michigan with contaminants that could not be diluted for an unprecedented ten days. The unexpected flooding also made it impossible for wastewater treatment plants to properly treat the overflow of storm water coming in. Run-off from agricultural and septic tanks all increased the E. coli levels in surrounding rivers, which then fed into Lake Michigan. At one point, river water levels during the storm got so high that they actually flooded the sewage plants. The EPA says that E. coli concentrations of 235 CFU (Colony Forming Unit) per 100 ml of water would be an acceptable risk level for freshwater sources. At the height of its contamination, E. coli levels reached an estimated high of 1,200 CFU per 100 ml of water. In other words, an average of 17 out of 1000 swimmers could expect to get a gastrointestinal illness from swimming in parts of Lake Michigan after Ike, in comparison to the usual 8 out of 1,000 people. USGS scientists say E. coli levels are now back to normal but the sediments in the water have yet to be cleaned up. Ike proves that we live in a fluid environment and what happens to our neighbors could eventually affect us too, be it upstream or downstream. "17 out of 1000 swimmers could expect to get a gastrointestinal illness from swimming in parts of Lake Michigan after Ike"
Bacteria, air floating, can make a tourist to Mexico sick. Local people are acclimatized, immune to the bacterial fauna. Bird flu, malaria, camel viruses, what next ? Add high altitude insect gobbled by high altitude bats, and special raindrops you got. Flying Pigs with lipstick, really cute, but the cleanup is left for the ground dwellers to swim in. What effect did this have on the zebra muscles? Can they tolerate this environment or did Ike get rid of them or was where they live affected? What happened to the Asian Carp or the fish that jump out of the water at the sound of a boat motor? Interesting. I grew up in the midwest and the weather seems much more volatile these days. Is it just media coverage or reality? I know Sara Palin doesn't like to think of causes... but I wonder if the volatility of the weather might be linked to global warming? "I wonder if the volatility of the weather might be linked to global warming?" CO2 radiates, cools the Tropopause and above, precipitating H2O. Nice BLOG. The ground was already saturated by a stalled cold front so the increased flooding caused runoffs from streams and rivers, dumping sediment into Lake Michigan and increasing E. coli levels in the water. Keeping them honest: How bad was Ike?